Baphtomet began as the lord of the 5th plane of Hell. Closely aligned with Geryon against Mephisto, the two were defeated and Baphtomet - for a time - was cast out of Hell into Tehra... to die. Degenerating from a hell lord, he shed his might and glory and increasingly looked like a zombie minotaur. Imagine his surprise when a fallen minotaur (the monster type) found Baphtomet. It's not known why, but the minotaur shrugged off Set's Dream long enough to tend to Baphtomet. He saved Baphtomet's life. Maybe it thought Baphtomet a fellow minotaur? The hell lord did not know what to make of this and so rewarded the beast the only way a hell lord knows... a covenant of service is made for some gift. Sensing only hunger and fear, Baphtomet grew frustrated and conferred upon the beast enough intelligence to speak. Immediately, the beast fell to the ground and worshiped Baphtomet. This pleased the hell lord as it is fitting that subservient mortals know their place. What came next surprised and shocked Baphtomet. Tehran worship for this single minotaur augmented Baphtomet's power in a way he had never felt before. Together, they sought out other fallen minotaurs and brought them into worship. With each new convert, Baphtomet's power grew. He lingered with them long enough to ensure he understood what had happened. He became their first emperor and seeded an empire of his own children with their females. The best offspring he gave to the strongest and most loyal of the subservient ones. Very quickly, a cleric arose. 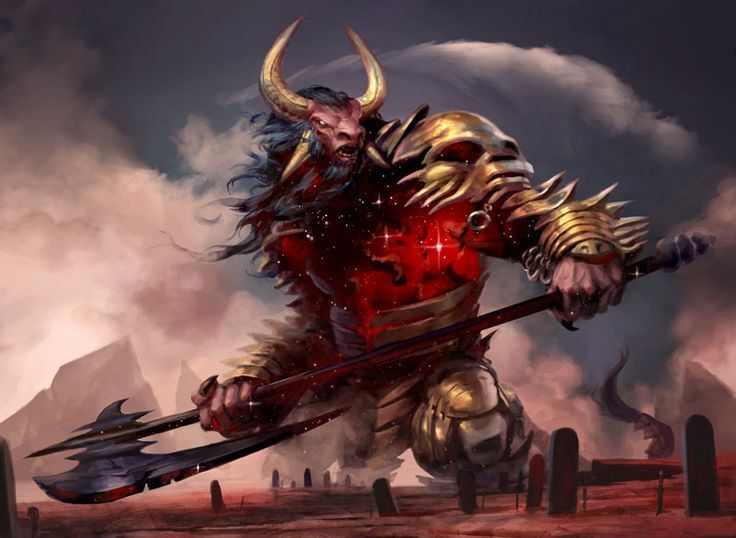 In Tauran history, it is said that the fallen minotaurs rose to sentient worship in 7 Days. Who knows how long it took? All we know is that, at some point, Baphtomet left and reconquered the 5th Plane. Now the racial god of minotaurs, Baphtomet rarely intervenes in his people's doings. The imperial line of red-furred minotaurs continues to rule. The clerics represent the socio-political and military structure of the people. Most minotaurs are not active in their faith but are put through Consecration at birth. Their society is mysterious, misogynistic, and brutal. At some point, they built great stone ships and began exploring the Tehran world. Like the Pharaohs of Egypt building pyramids, each emperor builds a World Galleon called a Blade of Stars in hopes that Baphtomet will return and join them in person. Sometimes he does. World galleons are stone ships as long as two football fields. Though they also make smaller ships, and not all of stone, the world galleons drive and shape Tauran culture and life. Minotaurs are born unnamed. If they have red fur they are entered into imperial service. If they do not have red fur, they can only progress through achieving great feats. Taurans are not named until they achieve a feat and then their name represents that feat. A stone mason aboard a world galleon is "Hey you, fix this" until he earns a name. Then, he might be named "Stone Repairer." They take great pride in their names. Navigational names like "North," "Eastwind," or "Guide Star" are reserved for imperials serving in the most important of roles - ship navigators, officers, and command. With enough wealth, a Tauran can buy a harem. Females are bred in captivity, are not allowed to talk or learn, and are judged purely by the merits of their offspring. Females and children are considered slaves. Male children are sold into indentured servitude and must buy their freedom. Not all males succeed in buying their freedom though most are freed. Taurans do not have the patience and cunning to entrap one of their own for a lifetime and are generally too worried that their "servants" will damage their reputation. Most are freed upon payment, assisted with getting a loan to buy their freedom, or are given some "heroic task" and then freed. Favors though... these can last a lifetime. Though not really religious, except the clerics, minotaurs are sensitive about 2 topics: 1) Baphtomet is awesome, and 2) minotaurs are not related to cattle. Violation of these two topics results in death threats and brutality. Minotaurs eat cattle. Being consumed by one's fellows is the ultimate show of disrespect and is reserved for traitors and heretics who become the main dish in great festivals. In Tehra, only minotaurs have ships capable of circumnavigating the globe. They encountered Morbatten in 908 DAR.